Oral Democracy studies citizens' voices in civic and political deliberations in India's gram sabhas (village assemblies), the largest deliberative institution in human history. It analyses nearly three hundred transcripts of gram sabhas, sampled within the framework of a natural experiment, allowing the authors to study how state policy affects the quality of discourse, citizens' discursive performances and state enactments embodied by elected leaders and public officials. By drawing out the varieties of speech apparent in citizen and state interactions, their analysis shows that citizens' oral participation in development and governance can be improved by strengthening deliberative spaces through policy. Even in conditions of high inequality and illiteracy, gram sabhas can create discursive equality by developing the 'oral competence' of citizens and establishing a space in which they can articulate their interests. 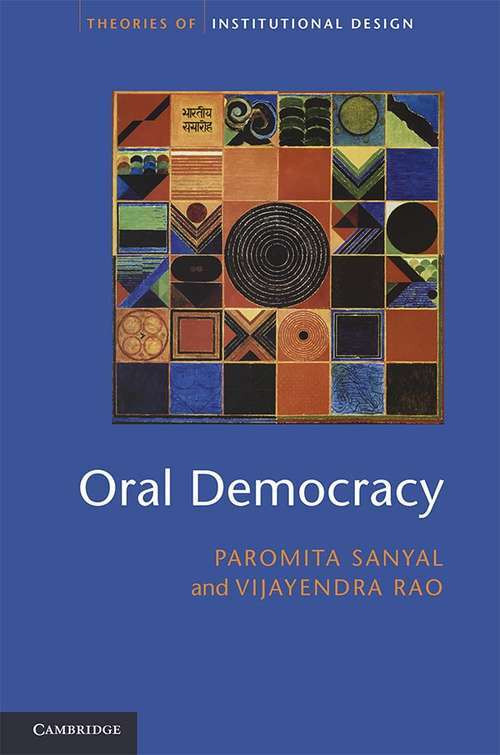 The authors develop the concept of 'oral democracy' to aid the understanding of deliberative systems in non-Western and developing countries. This title is also available as Open Access.